Start at the center of Nashville's entertainment universe, 5th and Broadway, where the oldest residence in Nashville, the legendary Ryman Auditorium and the world's most famous honky tonk Tootsie's Orchid Lounge greet you. Time-travel to the days before Prohibition with a stop at Nashville's Silver Dollar Saloon (2nd & Broadway), where drink, ladies, songs, and games of chance were the rule, not the exception. 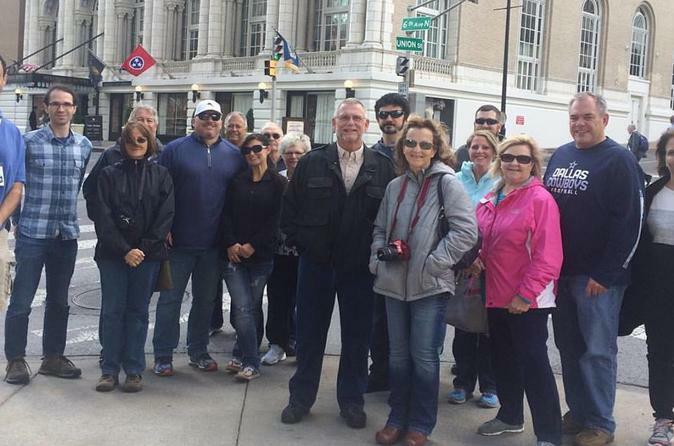 Walk down Market Street through Butler's Run to Riverfront Park, where the hustle and bustle of Nashville's river trade made it the 2nd largest city west of the Appalachians. Amazing views of The Cumberland River, Titans' Stadium, and an exact replica of Nashville's first settlement - Fort Nashborough, where the Cherokee almost ended Tennessee's capital before it got started. Head to Nashville Public Square and listen to tales of Andrew Jackson, Tennessee's most (in)famous president, whose exploits in war were only eclipsed by the controversy of his decisions. Off to Printers Alley (Nashville's historic "Men's Quarter") where the seedy and oft-fun side of Nashville reveals Skull's Rainbow Room, a famous Johnny Cash haunt, along with the site of The Jolly Roger, where Little Richard and Jimi Hendrix cut their chops before skyrocketing to stardom. Continue to Cherry Street (4th Avenue), whose notoriety was so great "no modest woman" would dare risk her reputation treading upon it. Through The Arcade we'll make a brief stop at Country Legend Chet Atkins' Statue before a short trek to The Capitol, one of America's most stunning. The Tennessee State Capitol is a treasure trove of history and was instrumental in the Union's defeat of Confederacy. A brief tale of the critical role Nashville played in Women's Suffrage at The Hermitage Hotel and our tour ends with brief stops at Downtown Presbyterian Church, site of the original Maxwell House, and then we are then in "Honky Tonk Heaven" where live music beckons you to your next adventure.